J H Bogran: Could James Bond be a Time Lord? Could James Bond be a Time Lord? I’m sure in the fifty years of both franchises this question may have aroused before, but at no time better than our present is this theory more plausible, after a fashion. James Bond’s canonical debut was in 1962 with the movie Dr. No. while the first episode of Doctor Who aired in 1963. So at one year apart, they are roughly the same age. Eleven actors have played the Doctor, while six have played Bond. Every incarnation of both had somewhat similar personality, and up until Daniel Craig took over Bond’s role, both characters would share previous incarnation’s memories. The Doctor uses a T.A.R.D.I.S., Bond always finds an Astor Martin. Both have used gadgets. Speaking of gadgets, don’t you think the breather device used in Thunderball does look a bit like a stylized sonic screwdriver? And what about companions? Always pretty damsels-in-distress seem to populate the path of both characters. As to the different levels of intimacy they reach with the companions, I won’t comment to keep this post PG-rated. But they have certainly fallen in love in more than one occasion: Rose Tyler and Joan Redferm for the Doctor, and Tracy Di Vicenzo and Vesper Lynd for Bond. 1. 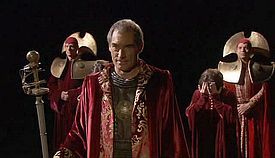 Timothy Dalton played both James Bond, and the Lord President of the Time Lords! Last year we celebrated Bond’s fiftieth anniversary with an above-average excellent movie, a side show of parachuting with the Queen of England into the Olympics Opening Ceremony. Now things are gearing up for Doctor Who celebration that will, or should, be quite memorable as well.